Join us for the morning and learn the secrets of this ancient traditional rural craft to make your own willow plant support, which look wonderful in the garden and are great for Sweet Peas, Runner Beans and anything else that climbs …except for small children! 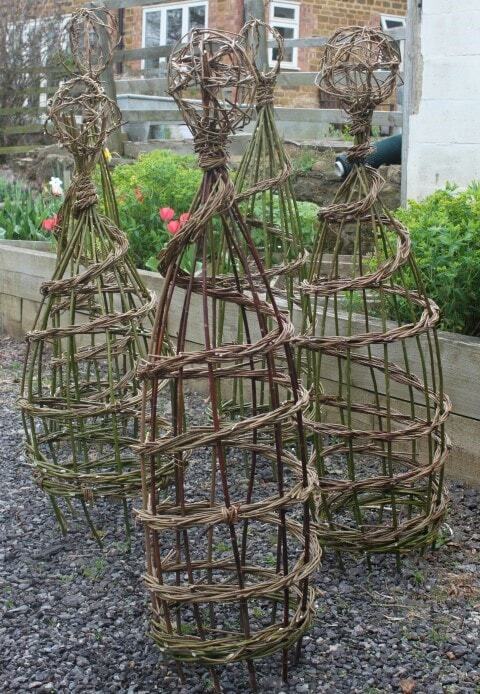 Join us for the morning and learn all the secrets of this traditional rural craft and create your own Willow Plant Support for your garden! Originally designed to do a practical job in the garden, they do also add a wonderful sculptural element to your outdoor space, whilst being made from a natural material that blends in with a growing environment. We are delighted to welcome back Bert Manton, a local country craftsman, to run this workshop. Bert has spent the last forty years learning his skills from the best and is now a master in his own right … he will keep you entertained with his humorous anecdotes and interesting stories throughout the morning! During the morning, with Bert’s expertise and guidance, you will make your own Willow Plant Support which do look wonderful in the garden and are great for Sweet Peas, Runner Beans and anything else that climbs …except for small children! Plus there is always a great feeling of satisfaction when you know that you have made them yourself, and, if you grow lots of climbers, learning this new skill could save you a fortune too! The number of attendees on this course will be limited to a maximum of 10 This workshop will run from 9.30am to 12.30pm. Visit our gallery to see the fun we had in a previous year. Click here to learn more about Bert Manton It is your responsibility to notify us, in advance of attending any event at Bay Tree Cottage, of any dietary requirements or food allergies. Bay Tree Cottage does not assume any responsibility for adverse reaction to any foods consumed.